The Colts have won three straight games and can get back to .500 — if Andrew Luck beats Tennessee again. INDIANAPOLIS — The Tennessee Titans believe a whole new look might solve their Andrew Luck problem. The Titans (5-4) have stolen a page right out of New England‘s playbook and made it work. Even in the game in which Luck initially injured the shoulder, Week 3 in 2015, his late rally gave the Colts their first win of the season. He has thrown at least one touchdown pass in a league-high 32 consecutive games and three or more TDs in six straight games, fourth all time behind Tom Brady, Peyton Manning and Dan Marino. 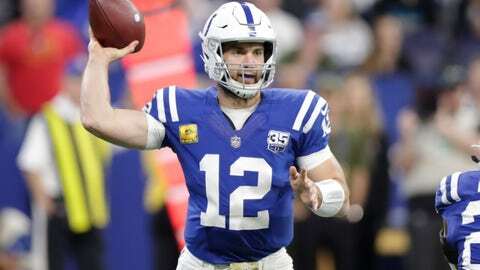 Luck’s completion rate, 66.3 percent, is a career best and he hasn’t been sacked in 185 drop-backs, another career high. The health of Tennessee quarterback Marcus Mariota has improved dramatically since an elbow injury produced numbness in his throwing hand in the season opener, and it’s shown. In the past two games he has completed 69.9 percent of his passes for 468 yards, four TDs, no interceptions and a 122.2 passer rating in victories over Dallas and New England. Mariota also caught a 21-yard pass and ran for 21 yards in last week’s victory over the Patriots. It’s not just the obvious stats showing how well the Titans have played defensively. In the second half last week, New England managed only six first downs and 117 yards and converted 1 of 7 third downs. The improvement also coincides with the return of strong safety Kenny Vaccaro, who missed three games because of an injured elbow. Former Colts receiver Reggie Wayne returns to Lucas Oil Stadium for his induction into Indy’s Ring of Honor. Wayne spent his entire 14-year career with the Colts, playing in a franchise-record 211 games and catching 1,070 passes for 14,345 yards and 82 TDs. He’s 10th in the NFL all time in receptions and yards receiving and was part of both of Indy’s Super Bowl teams. Manning, Marvin Harrison, Edgerrin James and Jeff Saturday, all former teammates, have already been inducted. Tony Dungy, who coached Wayne, and former general manager Bill Polian, who drafted Wayne in 2001, have also been inducted.